A perfect gift for sponsors, sponsees, or anyone in recovery! 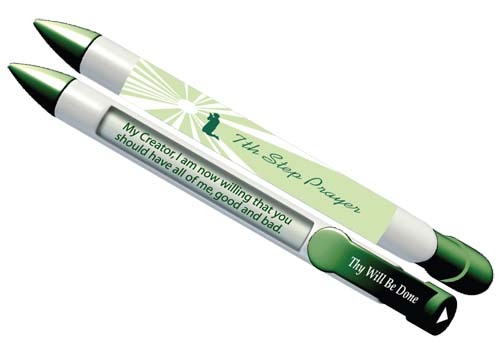 With each click of the button, a clever mechanism rotates through each verse of The Seventh Step Prayer. Message 1: My creator, I am now willing that you should have all of me, good and bad. Message 3: which stands in the way of my usefulness to you and my fellows. Message 4: Grant me strength, as I go out from here, to do your bidding. Amen. Serenity Pens are nicely balanced with a slightly thicker body than standard ball point pens - they feel quite good in the hand! More importantly, they write very well! These are not your typical plastic throwaway pens! Great item. Bought them for the bookcase at the alano club and sold them all on the first day.